Colcestrians toured India without needing to bring their passports. 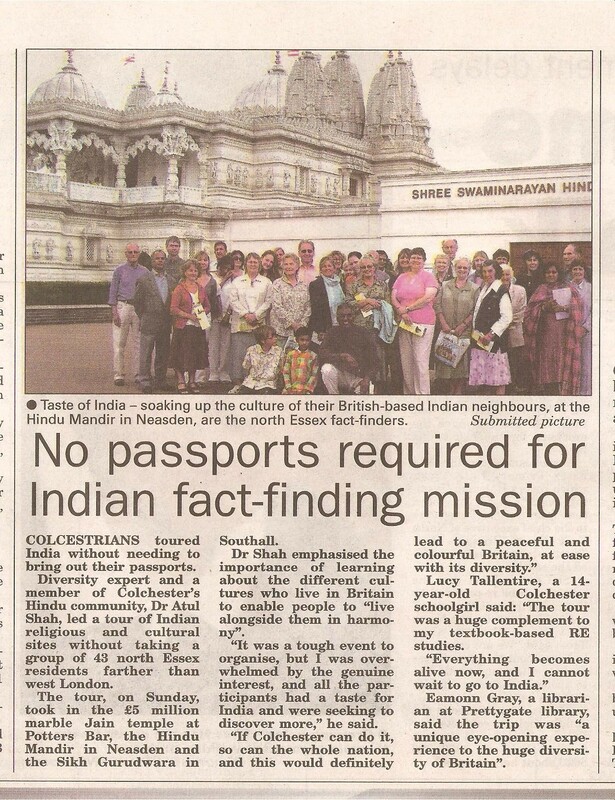 Diversity expert and a member of Colchester's Hindu community, Dr Atul Shah, led a tour of Indian religious and cultural sites without taking a group 43 Essex residents farther than west London. The tour, on Sunday, took in the £5 million marble Jain temple at Potters Bar, the Hindu Mandir in Neasden and the Sikh Gurudwara in Southall. Dr Shah emphasised the importance of learning about the different cultures who live in Britain to enable people to "live alongside them in harmony". "It was a tough event to organise, but I was overwhelmed by the genuine interest, and all the participants had a taste for India and were seeking to discover more, " he said. "If Colchester can do it, so can the whole nation, and this would definitely lead to a peaceful and colourful Britain, at ease with its diversity. " Lucy Tallentire, a 14-year-old Colcester schoolgirl said: "The tour was a huge complement to my textbook-based RE studies. "Everything becomes alive now, and I cannot wait to go to India. " Eamonn Gray, a librarian at Prettygate library, said the trip was "a unique eye-opening experience to the huge diversity of Britain".